Standing elegantly in the most efficient business center, Guangzhou Ocean Hotel is a deluxe 4-star hotel attracting guests from all over the world with its special sailing ship-style architecture and refined services. Enjoying a convient location, Ocean Hotel is set next to large shopping malls, and only 6 minutes by walk to Metro Station and a 20-minute drive from China Import and Export Fair (Pazhou) Complex. The 290 Guestrooms, renovated luxuriously and elegantly, equipped with High-speed Internet access, fax machine, electric safe, is suitable for the businessman. Guests can watch more than 30 satellite TV channels which include Hong Kong, USA and Japan. Lobby, reception, guest rooms, conference rooms, etc. in Guangzhou Ocean Hotel, have been renovated completely, will welcome guests from home and abroad with its new appearance. 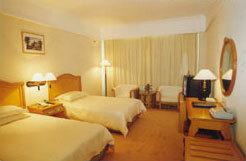 There are 290 rooms in Ocean Hotel, such as standard room, executive room, executive suite and presidential suite room.